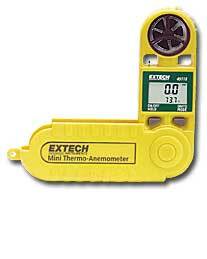 The 45118 Min Thermo-Anemometer from Extech is a great little wind velocity meter, thermometer and windchill indicator. Perfect for monitoring outdoor conditions when hiking, camping, boating, windsailing and so on. The fold-over housing protects sensors and acts as a handle during use. The 45118 is water resistant and even floats! Optional soft vinyl carry pouch (CA895). Order below. Optional spare mini impeller vane 2-pack (45116). Order below. Optional tripod mount (TR100). Order below.